Astronomers have discovered two clusters full of very bright stars on the verge of merging. The clusters are located at a distance of 170,000 light years from Earth in the Large Magellanic Cloud, a small satellite galaxy of our Milky Way. 30 Doradus an active stellar nursery where stars are born in clouds of gas and dust for already more than 20 million years. 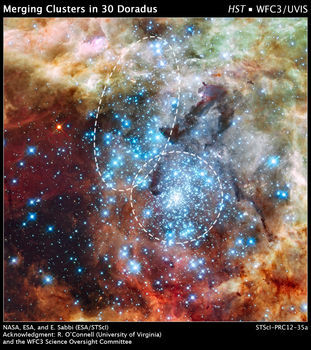 According to some models, the giant clouds from which star clusters are created fall apart in smaller pieces. The small parts can later merge into a heavy cluster. This is what the astronomers think to see in the center of 30 Doradus.